A white water tower. A bucket of paint. An abandoned ladder. The cover of darkness. And someone who loves The Post. It was the perfect storm for a hit and run graffiti event in Cedar Springs last night. 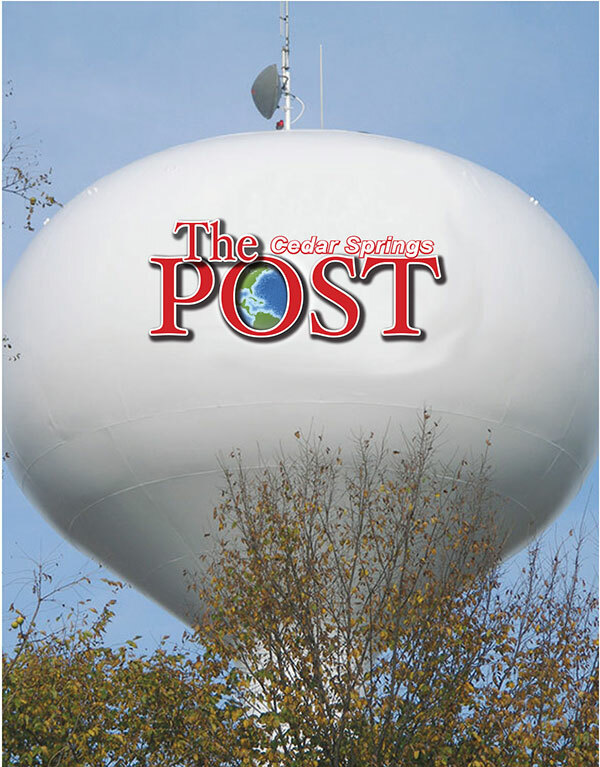 Police are looking this morning for the person(s) who painted the logo of The Cedar Springs Post newspaper on the city’s water tower on Pine Street. People gawked as they drove by, causing a couple of minor traffic crashes. That’s when police discovered the vandalism. The councilor didn’t specify how much they might charge, but said it would be in the $2,499 range. “And they would have to paint it themselves, or we wouldn’t make any money,” he noted. The Post editor caught up with Post publisher Lois Allen at a local hardware store, while she was trying to return some paint. “It just isn’t the right red,” she said, wiping her hand on a paint smock she was wearing. But she thought it was great that someone painted the Post logo on the water tower. “I hope they don’t get caught,” she added. If you have any info on who might have painted the water tower, please 616-APRIL-FOOLS.